While many of us struggle to lose weight, quit smoking, go back to school or stick to goals aligned with other popular New Year’s resolutions, children all over the world struggle to make it through each day while hungry and living in dire circumstances. Within HoPE Learning Centers, 4040 children face many challenges associated with poverty, but they also thrive among friends while they receive daily nutritious snacks, traditional academic tutoring and innovative lessons that help transform the ways that they think and act. 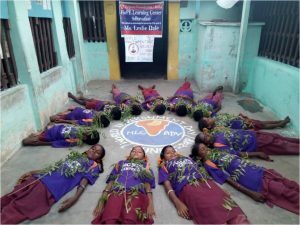 Children at Adavathur Center stood up for the rights of trees during World Environment Day. 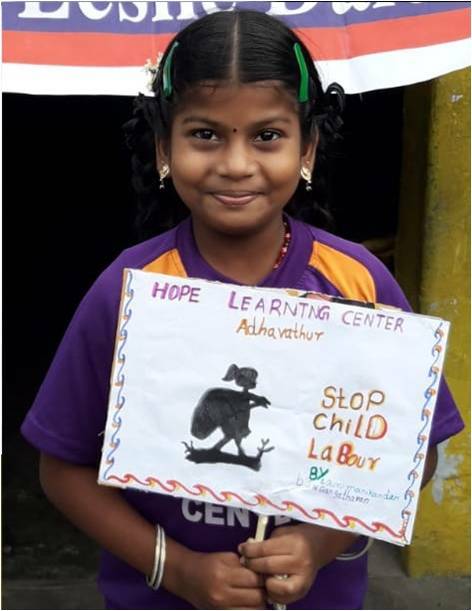 Durga created a sign in opposition to child labor. 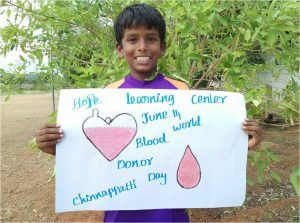 Kumar encouraged people in his village to donate blood on World Blood Donation Day. These are just three of the 4040 stories of children who have so little but do so much to lead exemplary lives, often centered on helping others. While doing whatever it takes to stick to your personal resolutions in the third week of this new year, here is a possible solution – setting and keeping a resolution centered on others is a great way to reduce karma! It doesn’t take much to support and feed a special child, like Nadini, Pavithra or Nithesh Kumar. Right now, only $10 per month covers the costs of HoPE Center sponsorship, tutoring, lessons, materials and daily mini meals. For only $350 per month, you can sponsor an entire HoPE Learning Center (which will cover the daily costs for 40 children)!